In the process of building the Salamander Librarian I'm working on, I wanted to realy reinforce the "librarian" idea. You usually see lots of cables and such on these guys... more than the average Marine. I decided I was going to do this with his backpack as well. 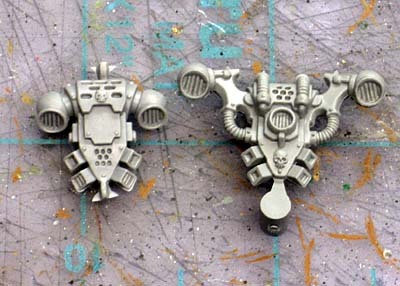 Problem was, only the Chaos backpacks have the cool cables running over the tops of them. Time to make my own version then. This kind of conversion fits well because it's very subtle. It's just a slight change to an easily identified piece of equipment that will make this guy stand apart from other models. You'll need two backpacks, one Chaos backpack with the cables over the top and one Loyalist version with the regular vents. Cut the vents off both backpacks. On the Chaos version, trim down to the red lines so really all you have left is the "body" of the backpack. On the Loyalist version, carefully trim away until you are left with the entire vent assembly to include the angled mount. Then it's just a matter of gluing the Loyalist vents onto the Chaos frame. If you're careful and you took your time, you'll only need a tiny bit of greenstuff to fill in any gaps you might have around the seam. Make sure your vents line up perfectly when you're gluing then on too. You don't want one side pointed in one direction and the other facing another way. 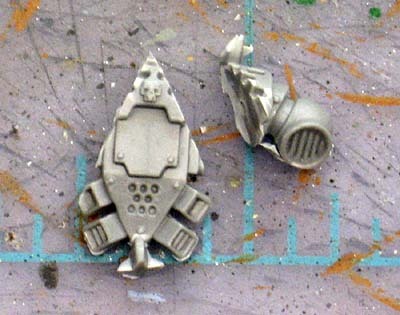 Wow, that's an incredibly clean conversion -- it looks like it came off of a sprue that way! 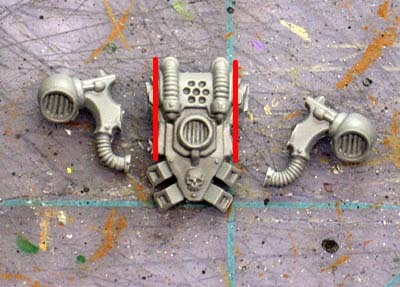 very clean ron, but wouldnt it have been well cheaper/easier to just take the vents from the other end of the chaos pack. Since they look the same. Rogue Valley Minis: There are lots of different ways to do this... it's a matter of preference and what exactly you want the end result to look like. You could use just about any vent or even something else for that matter. RonSaikowski sez: "You could use just about any vent or even something else for that matter." 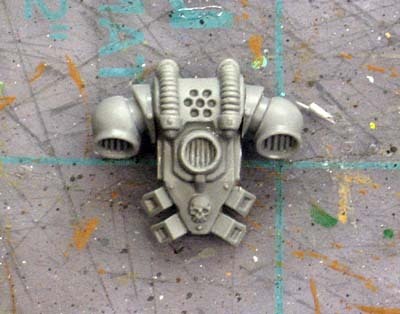 I've done some backpack conversions for my CSM Warband, and I'd say that so long as you get the parts assembled neatly with enough similarity to the original pack style, you can get all kinds of crazy and have it turn out decent. Yours looks excellent and fairly seamless, and I'm looking forwards to seeing it on the figure. Christopher: Nice job. Taking the skulls and adding them to the different pack frame makes for a subtle change. Well done Sir.